What is a banana plum bread, you ask? Well, it is basically a banana bread that has plums in it, if I’m being perfectly honest. I was blown away with how delicious late summer and early fall plums have been, so I’ve been trying to find ways to incorporate them into my recipe. 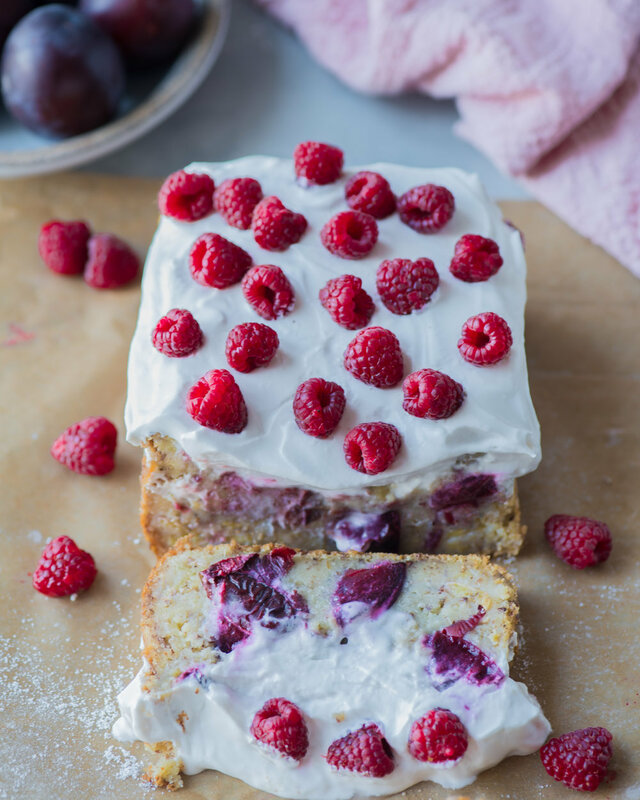 If you haven’t seen my fluffy Plum Almond Cake, I highly recommend it! I recently found my kitchen counter crowded with a bushel of plums and nearly blackened bananas, so it wasn’t a difficult decision: I had to make a banana plum bread. Typically, banana bread is very sweet due to the combination of sugar and super sweet, ripe bananas, and while that deep sweetness is usually a good thing, sometimes it’s nice to add a little flavor contrast. That’s exactly what the plums do in this recipe. The result is a complex banana bread that is sweet and moist with little pops of tart juiciness spread throughout. And if the sweet-tart combo wasn’t enough flavor and textural contrast for you, I’ve topped this loaf with a creamy coconut frosting. It really takes this loaf over the top and makes it feel truly decadent. It’s totally optional, but if you do make it, I recommend using a very thick coconut yogurt. I love the one from COYO, which is made with three simple ingredients: coconut milk, tapioca starch, and live vegan cultures. It’s incredibly luscious and so thick that it actually feels like a frosting. That’s about all I have to say for this easy banana plum bread, so I hope you enjoy it. If you make one of my recipes, be sure to tag me on Instagram so I can see your creations! *For 1 flax egg, mix 1 tablespoon ground flaxseed meal with 2 1/2 tablespoons water, stir and let stand 15 minutes to thicken. Preheat your oven to 350°F (or 180°C). Line a standard 9x5 loaf pan with parchment paper or grease and flour the pan. Pour the almond milk in a measuring cup and add the apple cider vinegar. Stir to combine and set aside for 5 minutes to allow the mixture to curdle like buttermilk. Combine the flour, baking powder, baking soda, and salt in a medium bowl and whisk well. In a large bowl, whisk together the olive oil (or coconut oil) and sugar until incorporated. Then add the almond milk-vinegar mixture, lemon juice, vanilla extract, and almond extract and whisk until well incorporated. Add the flax eggs to the wet mixture and whisk until just combined. Gradually incorporate the flour mixture into the wet ingredients mixture in two batches, whisking until the ingredients are just incorporated. If the mixture gets to heavy to whisk, switch to a wooden spoon. Fold in the the mashed bananas with a rubber spatula. Pour 1/3 of the banana bread batter into the prepared loaf pan. Top with half of the plum slices. Pour another 1/3 of the batter on top, and add the remaining plum slices. Pour the remaining batter on top and smooth out with a rubber spatula. Bake the banana bread in the preheated oven for 45-55 minutes. The bread will be done when a toothpick inserted in the center comes out clean. Allow the banana bread to cool on a wire rack for 20 minutes before removing from the pan. To make the Coconut Yogurt Frosting, whisk together the yogurt and maple syrup in a medium bowl until smooth. Refrigerate until ready to use. Once the bread is completely cooled, top with the frosting.